The newly-elected President, Tran Dai Quang, has pledged to make all-out efforts to fulfill the duties of State leader, who also chairs the Council for National Defence and Security and commands the people’s armed forces. In a brief interview granted to Vietnam News Agency reporters, he said being elected to the Presidency is a great honour and responsibility. The experience of his predecessor Truong Tan Sang and other former State leaders will be invaluable to him in realising the tasks assigned by the Party, the National Assembly and the people. Quang said he will apply himself to fine-tuning the legal system to constitutionalise the Resolution of the 12th National Party Congress and the amended 2013 Constitution, and also in improving the effectiveness of the State management. He will steer the building of regular, elite and modern people’s revolutionary armed forces, so as to firmly safeguard the country’s independence, sovereignty and territorial integrity, along with political stability and peace for national development. The new leader added that he will work with, and ask the Politburo and the National Assembly (NA) to detail the duties of the Commander of the people’s armed forces, and the organisation and operations of the Council for National Defence and Security, as suggested by Truong Tan Sang at the ongoing 11th meeting of the 13th NA. He will also bolster the implementation of the consistent foreign policy of independence, self-reliance, peace, cooperation and development; proactive and active international integration; and ensuring a peaceful and stable environment while optimising external resources to develop the country. Another focus in his tenure is to press ahead with judicial reforms, thus ensuring pure, strong, democratic and strict justice and the protection of human rights, Quang noted. The President will also actively coordinate with the Vietnam Fatherland Front and its member organisations, to better people’s living standards, protect the rights and legitimate interests of Vietnamese expatriates, enhance democracy and strengthen national unity. He added that he hopes Vietnamese people living in the country, and around the world, will join hands in upholding patriotism, grasp opportunities and weather challenges to secure and build a prosperous Vietnam. 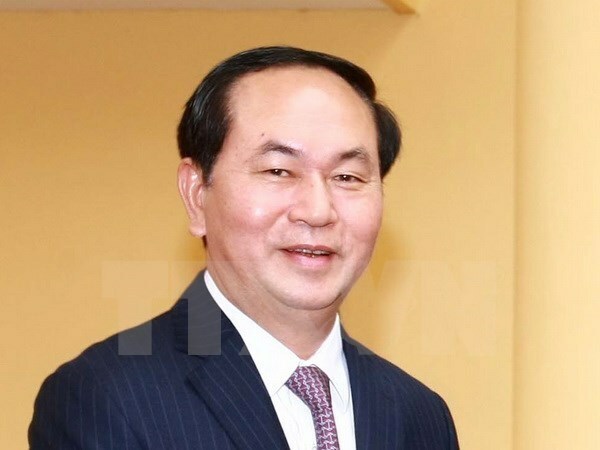 Tran Dai Quang, 60, who is a Politburo member and the Minister of Public Security, was elected to the Presidency on April 2. + July 1972 - October 1975: Student at people's police school and school of foreign languages under Ministry of Home Affairs (now Ministry of Public Security). + October 1975 - June 1987: Officer at Political Protection Department I, and deputy head of Political Protection Department II’s professional office under Ministry of Home Affairs (now Ministry of Public Security). + June 1987 - June 1990: Head of staff office and head of professional office, Political Protection Department II, under Ministry of Home Affairs (now Ministry of Public Security). + June 1990 – September 1996: Deputy Secretary of Party Committee of and deputy head of Security Staff Department, Ministry of Home Affairs (now Ministry of Public Security). + September 1996 – October 2000: Head of Security Staff Department, Ministry of Public Security; member of General Security Department Party Organisation; member of General Security Department Party Standing Committee; and Secretary of Security Staff Department Party Committee, Ministry of Public Security. + October 2000 – April 2006: Deputy Secretary of Party Committee of and Deputy head of General Security Department, Ministry of Public Security; promoted to Major General (2003); and conferred the title of Associate Professor (2003). + April 2006 – January 2011: Member of 10th Party Central Committee, member of Central Public Security Party Committee, member of the Central Public Security Party Standing Committee, Deputy Minister of Public Security, Promoted to Lieutenant General (2007), and conferred the title of Professor (2009). + January 2011 – August, 2011: Politburo member, member of Central Public Security Party Standing Committee, Deputy Minister of Public Security. + From August 2011 – now: Politburo member (11th and 12th tenures), member of National Defence and Security Council, member of Party Delegation to the Government, Secretary of Central Public Security Party Committee, Minister of Public Security, promoted to Senior Lieutenant General (2011) and General (2012), Head of Central Highlands Steering Committee, deputy of 13th National Assembly, Deputy head of Central Steering Committee on Anti-Corruption, Deputy head of central internal political protection sub-committee. + Elected President of the Socialist Republic of Vietnam at the 11th session of the 13th National Assembly on April 2.